There are two kinds of people on this Earth. The kind who are willing to pay $440 for a pair of RoboCop action figures, and the kind of people who aren’t. 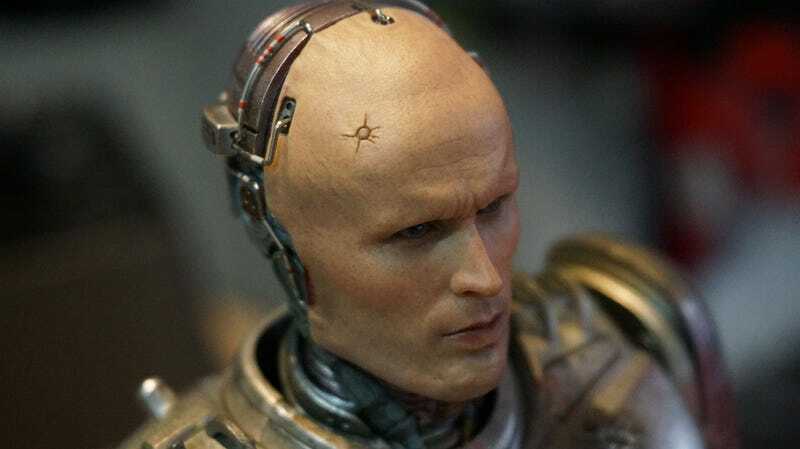 Whichever side you fall on, here’s a look at Hot Toys’ upcoming RoboCop two-pack (and a look at my kitchen), which includes both a 1/6 scale figure of the star of the series, along with a figure of Alex Murphy before he gets his, um, augmentations. Out in July, they’re pretty cool! Cool if you regularly spend hundreds of dollars on action figures that sit on your shelf forever, anyway. See how the eyes look “wet”? That’s the most fascinating thing about the likeness when you see the figures in the flesh. Not the likeness per se—though it’s indeed terrifying—but how he seems slightly alive. You can pose Alex twirling his gun. Cute touch. RoboCop gets a cool, shiny base. Alex, for whatever reason, does not. Which makes them look a little weird when you pose them next to each other. The back of RoboCop’s figure is as impressive as the front. As is standard with Hot Toys figures, you get a ton of accessories and extra hands. You also get two guns for RoboCop. This one is plastic, but the one in his hands is die-cast metal. A RoboCop figure wouldn’t be a RoboCop figure if you couldn’t do this. The pack also includes a Cobra Assault rifle, whose stand collapses and whose clip can be ejected. In addition to a range of pre-posed hands, RoboCop comes with two that are fully posable. The Alex Murphy figure is a bit of a disappointment. He feels very light and almost cheap compared to RoboCop. Part of this is down to the design of the character, I know, but when you hold them together you can clearly see a lot more work (and money) has gone into RoboCop than his human predecessor, who feels almost like an Action Man/GI Joe you’d buy in a toy store. You can see the pores and veins. That’s it! The two-pack is out in July. Note you can also get RoboCop seperately...for...$295.